The smartphone app does feature voice training to help the Echo understand you better and it’s a great idea to go through two or three sessions. Each session contains 25 phrases that you can use with the Dot so you’re being trained at the same time. 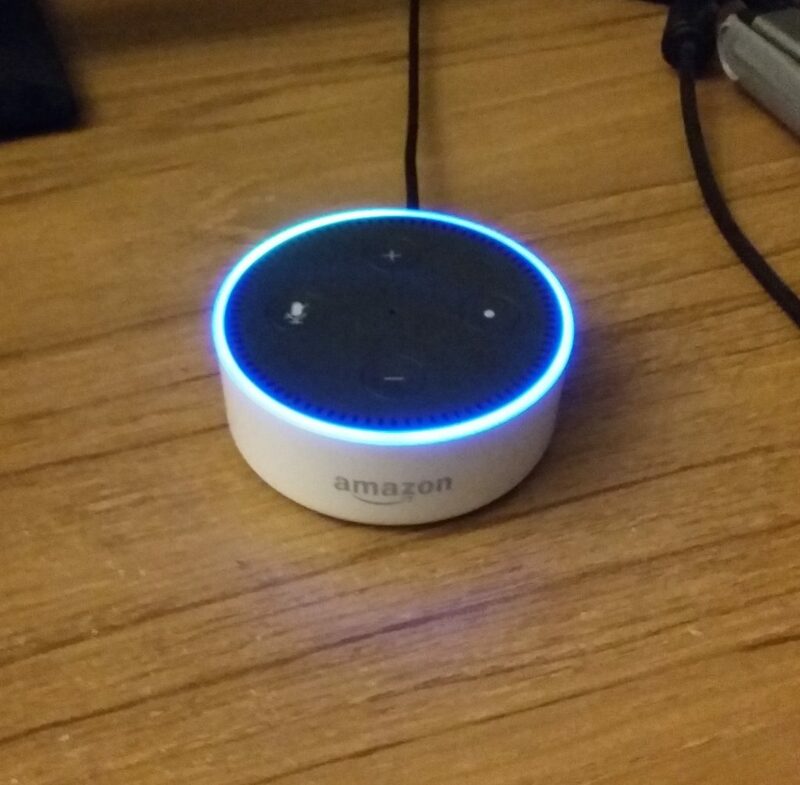 Each phrase starts with ‘Alexa’ so the device knows you’re talking to it. Beyond that, it’s mostly a matter of exploring the capabilities and experimenting to see what questions will work. I’ve been randomly asking Alexa questions for the past 24 hours and am starting to get a pretty good sense of the service’s abilities and limitations. So far, for me, Alexa’s great for voice control of music but to really make that work, you need Amazon Prime or another music service like Pandora or Spotify. Alexa will play radio stations over the Internet via TuneIn so I just specify the station by call letters and it finds the station which is a lot less hassle than going to TuneIn or tracking down the station’s website and looking for a Listen Live button. It will also read Kindle books on command and works with Audible if you have it for a specific book. Alexa is good for information lookup although I think there’s progress to be made. Every question is a separate request with no reference to the last one so there’s not much opportunity to ask it to elaborate on something. It’s understanding of questions can be a little flaky, too. The information functions are being supplemented by third-party “skills” that you can enable through the Alexa app. For example, as the video here shows, if you ask Alexa the distance between two cities, it’s always going to give you the distance “as the crow flies” but there’s a skill you can enable so that you can say “Alexa, ask the distance between San Francisco and Los Angeles.” (you have to use that wording since you’re accessing a separate program) and then the service will tell you the road distance and the driving time. The Dot has a ring of seven microphones to hear in any direction and does a pretty good job of recording based on the voice samples that I’ve listened to. The Alexa app maintains a history of your requests to Alexa and you can listen to them as well as reading how they were understood. You can also delete voice samples from the system but this is not recommended as Amazon uses that history to continue improving your experience. I have noticed that the microphone isn’t always as responsive to the wake word as I’d like it to be when music is playing. I’ve also noticed that it will respond to recorded voice prompts such as the video above. I am impressed by some of the intuitiveness that the programmers have added. I’ve been trying to stump Alexa and last night I asked “What’s the buzz … tell me what’s a-happenin’?” and it responded with the latest news updates. This Flash news update can also be customized to the news sources you like. Alexa also gets some sci-fi and pop culture references and some basic conversation. I asked Alexa what it was doing for Thanksgiving and the response was “I figured I’d be spending it here. I hope you set a place for me.” I’ve noticed that Alexa alternates between different answers for certain casual questions. The Echo connects to other devices pretty well via Bluetooth and there’s more you can do with Bluetooth enabled outlets, thermostats, etc.. The Dot’s speaker is already pretty good for such a small device but I bought an inexpensive Bluetooth speaker to improve on it slightly. Be sure to turn off Voice Purchasing in the Alexa app or set a confirmation code to prevent unwanted orders. I heard my first product advertisement from Alexa while writing this article and when I didn’t say ‘No’ in time (I was actually muttering to myself in irritation), Alexa went ahead and placed the order for a board game I wasn’t interested in. I was able to cancel the order in time by going to Amazon.com but this is something to be aware of. 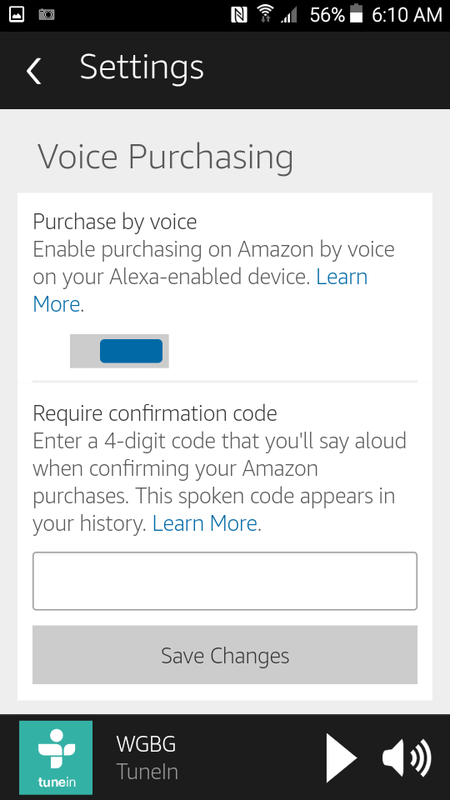 In the Settings panel of the Alexa app, there is a section titled ‘Voice Purchasing’ where you can turn off this ability or require a confirmation code (it seems to be on by default). It’s important to remember that the Echo and Echo Dot are also sales tools for Amazon.com. For the price, I’m not at all disappointed and I still have some exploring to do. While I think Alexa is a work in progress, the service definitely shows promise. I’ve already connected my Google calendar and Pandora account to Alexa and can see it becoming a valued assistant as future updates increase its understanding and abilities. A few sample commands. Alexa misunderstood my request to “silence” the alarm at one point. I’ve previously noticed that “stop the alarm” works fine. You can also ask Alexa to specify to a number of digits. EDIT, 12/14/2016 I originally made a point in this article of referring to Alexa with female pronouns like “she” and “her” but realized that it was inappropriate. Alexa is not intelligent or sentient and Amazon’s use of a female voice for the service does not make it any more so. I decided that to follow their lead in personifying the service was an over-promotion of what is, in the end, a technology product. It seems very interesting to have Alexa at home. Because read your article, i will likely buy one for my home. 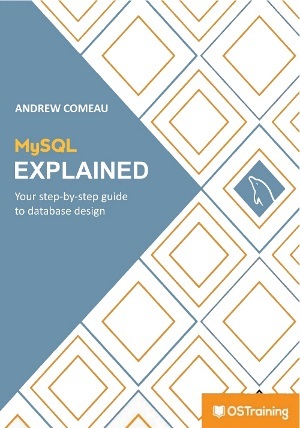 Thanks Andrew for sharing your experiences. Thanks for the review. Many updates are underway and Alexa is a mighty little boom now.